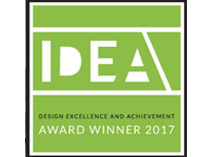 We are so honored to receive the 2017 DEA Award from Inmod! The Design Excellence and Achievement Award celebrates the highest level of professionalism and commitment to the Interior Design field. Inmod acknowledged us for the inspiration, passion and achievement in transforming interior spaces into expressions of modern class, elegance and livability.